So exciting! 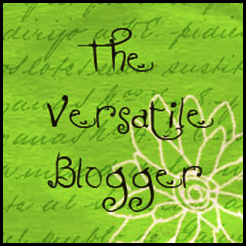 I was given The Versatile Blogger Award by Mary at MaryMaking.. I've been working hard at this blogging "thing". Always "Dreaming, drawing and Creating". It has been an honor to receive this award"! On checking out Mary Making I found it to be fresh, colorful and inspirational. I think in some ways our styles are very similar. The uninhibited and care free use of color brings a smile to my face. And anyone who uses a ladybug for inspiration is a friend of mine! Thank you Mary for selecting me. 1. I'm a quilter. I won a ribbon last year at the Vermont Quilt Festival. 2. I have a crazy dog and a charming cat. 3. I love to bake, apple pie is my specialty. 4. I won "Teacher of the Year" in 2003. Sponsored by the Wal- Mart foundation. 5. I love ladybugs, they bring back loving memories of my mother. 6. I have two children that I adore, a daughter and a son. 7. I supervise student teachers for the art department at the College of Saint Rose. Is that the Vermont Quilt Festival that happens in Bennington every fall? That's where I live! What a great accomplishment. Thanks for nominating me for the Versatile Blogger award! I love your blog. Hi Barbara, you're welcome! I can't wait to sit and study your post yesterday. It's wonderful. Actually the quilt festival is in Burlington. And it was exciting to win a ribbon there! I'm not far from you I live in Clifton Park. Keep up the good work. Hi, I just discovered your blog. There's so much great stuff I plan to explore in it, so you'll probably be hearing from me again as I dig through your older posts. It is indeed a small world. I'm less than an hour up the Northway from you! Highly informative. Congratulation on your versatile blogger award. We are so glad to hear that. You deserved it!